 S. Atfeh, "The phosphoric resources of Syria," in Phosphate Deposits of the World, Vol. 2, Phosphate Rock Resources, eds. A.J.G. Notholt, R.P. Sheldon, and D.F. Davidson (Cambridge, UK: Cambridge University Press, 1989). "Nonav - Syria - Industrials and Pharmaceuticals Report," The Bi-Me eNewsletter, 21 December 2004, www.bi-me.com. Carlotta B. Chernoff, and G.J. Orris, "Data Set of World Phosphate Mines, Deposits, and Occurrences - Part A.: Geological Data," U.S. Geological Survey, 2002. 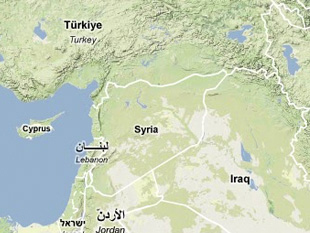 Thomas R. Yager, "The Mineral Industries of Jordan, Lebanon and Syria," U.S. Geological Survey, 2001, http://minerals.usgs.gov. S. Atfeh, "The phosphoric resources of Syria," Phosphate Deposits of the World, Vol. 2, Phosphate Rock Reserves, A.J.G. Notholt, R.P. Sheldon, and D.F. Davidson eds., (Cambridge, UK: Cambridge University Press, 1989). Y. Koudsi, S. Khorfan, H. Shleweit, A. Dahdouh, and M. Sweid, "Effect of Oxidation-Reduction on the Extraction of Uranium from Wet Phosphoric Acid by DEHPA/TOPO," Aalam Al-Zarra, March-April 1998, 54, pp. 59-62; S. Khorfan, Y. Koudsi, A. Dahdouh, and H. Shleweit, "Preliminary investigation on the extraction of uranium from Syrian phosphoric acid," International Conference on Uranium Extraction, Chinese Nuclear Society, 1996. This article provides an overview of Syria's historical and current policies relating to nuclear, chemical, biological and missile proliferation.